January is National Human Trafficking Awareness Month, and human trafficking continues to be a national and state-wide problem year-round. Greenville Police Chief Justin Lovvorn says it remains one of the fastest growing criminal industries and takes a special eye to identify. “Human trafficking sometimes takes a lot more in depth training for the officers and investigators involved to really recognize that someone is being a victim of the crime,” Lovvorn says. Lovvorn says the police department has seen a few human trafficking cases. 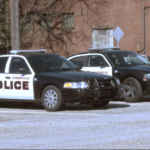 With I-65 and other major highways running through the city, the Greenville Police Department has to be prepared with in-depth training through the Alabama Attorney General’s office. Some of that training includes lessons with experienced human trafficking experts, programs, and seminars, which can be helpful in raising awareness to spot signs. Signs of individuals who might be a slave to drug trafficking are difficult to identify to those who may not have the necessary training. “The main thing is, if a person has limited access to friends, if you notice that they don’t seem to have a lot of personal belongings of their own, they’re not allowed a lot in public where they can shop and be free to what they want at different times,” Lovvorn says. With over 27 million slaves and counting world wide, Lovvorn says its going to take the public’s help to stop the issue. “It would really help if the public was educated in this type crime and knew what to look for as well,” Lovvorn says. If you believe you have witnessed a human trafficking situation, you are encouraged to dial 9-1-1 or call the National Human Trafficking Hotline.